The Paranormal is rapidly becoming a boom around the net and elsewhere these days. With shows such as Ghost Hunters, Paranormal State , Most Haunted among others, a great revolution is taking place here and now in the paranormal world. 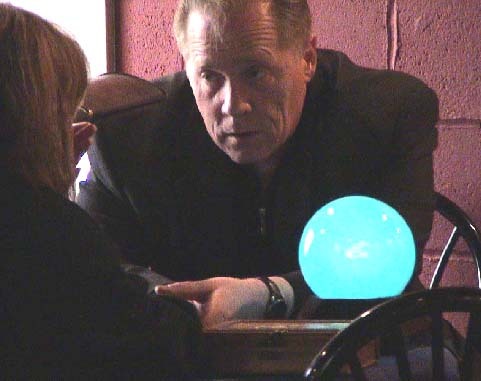 Suddenly, the net seems to be alive with web sites dedicated to the paranormal field. While looking through all these paranormal sites, a great many pictures pop up that are said to be ghostly images and manifestations. A great number of these refer to orbs and show us glowing white or colored spheres captured on film. On reviewing and researching on the subject, we are given explanations to what these spheres might be. Even though photography experts have demonstrated over and over that these round specs in photographs are simply dust, moisture or insects, paranormal sites continue to put up their photographs revealing orbs. What is more, many of them tell us what the colors in the orbs mean about the ‘spirit’ manifesting; ignoring the fact that the colors are nothing more than reflected colors in the dust, or from objects in the area. Of course you are going to get orbs at a haunted location if you use a flash to take your photographs! Whatever is moving around the air at that time is reflected because of the flash, and these spheres will appear anyway. What is more is the fact that the flash on digital cams are so close to the lens, that they will probably magnify tiny specs of lint or dust floating in the air and reveal a myriad of orbs, or a single orb depending on how many are in the view of the cam at that moment. Even though it seems as though I don’t believe in orbs, I do. Basically, I think it is very difficult to capture a true orb on film, and this also is true of other ghostly images as well. Therefore, ghostly mist can, in fact, be breath caught by the flash; vortexes can be a hair or a flying insect. The same can be said of rods. As for full-bodied apparitions, they are as elusive as the Loch Ness monster or Bigfoot himself. However, many examples of these continue to appear on the net on paranormal sites. We seem to be forgetting that ghosts do not perform on demand, nor do they pose for a camera, and that ghost hunting is a tedious affair of endless hours of waiting with no results to show the hard work we have been going through. Very recently there have been a great many photographs appearing on the net, which include ghosts captured on camera phones. While camera phones seem to be very useful as they can be transported in a pocket and are easy to manage, a few things seem to be ignored. The truth is that camera phones are great for taking quick shots of a place, but when trying to get evidence of ghostly activity, they are not the greatest tools out there! Even though a lot is said about holding a camera steady, or slow or fast shutter speed, the wannabe ghost hunters use them and present the pics they take as evidence of the paranormal. What is more, they refuse to analyze their photos, use no common sense at all, and crop and blow up the image to such an extent, that they invariably get faces and anomalies in their pics. They fail to understand that when an object is over enhanced, we can see faces and images as our brains work through the pareidolia/matrixing process, straining to make sense of the patterns we are looking at. Recently we carried out an experiment on my web site to see the results that could be obtained when taking photographs using a camera phone. I asked my members to take the pics in the daylight, shaking the camera, under poor light conditions and so on. The results we got are detailed in the article “Camera Phone Ghosts”. (http://www.ghostsamongus.net/v2/Content/pid=45.HTML) As we discovered, not all is as it seems, especially if there is a lack of proper light in the area. Not only is pareidolia to blame in these photographs, but Photoshop as well. It’s sad to see that many of the pictures out there today are altered using Photoshop these days. Personally, it makes me wonder if all these wannabe ghost hunters wish is for fame and fortune, and a cheap thrill, rather than seriously looking into a field that needs continuous study and research. Another aspect that must also be mentioned is the rapidly growing interest in ‘ghost cams’ which are web cams placed in various ‘haunted’ locations. People join these sites hoping to catch a glimpse of the ghosts advertised in the area. Can these elusive apparitions be captured? Possibly. However, a few tips should be mentioned to all the arm chair ghost hunters out there. In the first place, consider that many of these cameras are placed in homes which are inhabited. Thus, many of the ‘ghostly apparitions’ that are captured could very well be family members caught in a motion blur. Motion blurs occur when a human being walks by the camera during the refresh. I’ve seen so many of these blurs look so ghostly-like and transparent, that I seriously doubted them to be human at all. Unfortunately, they were family members and not ghosts. Another factor to consider is that at night these cameras seem to come alive, and pixelation takes up shapes and figures that appear ghostly in nature. All these are illusions, caused many times by patterns in curtains or cushions on sofas or carpets and even ornaments or every day objects in the home. Again, lack of proper lighting seems to be the culprit. A word of advice when capping from these ‘ghost cams’ is to take a picture of the area during the day for comparison. Also, try to understand that any object that is not meant to be in the area normally, such as a jacket left on a couch by a member a short time before, can seem to be a ghostly apparition of a figure on the couch in the dark. In short, use a lot of common sense and be prepared to spend countless hours of watching these cams, if you really want to catch an elusive ghost.